Introducing Pawfinity V3.8.1 March 2018 now with the highest overall security rating in the industry! Pawfinity is designed exclusively for pet groomers, kennels, and daycare service business to help improve efficiency and enhance the overall client experience. Our clients are saving hours every week using our revolutionary cloud-based service. Free 30 day trial, setup, and support! Come see why more Pet Pros recommend Pawfinity than any other pet-specific service on the market. Pros: I love the speed and reliability of this software. While other software I have used made me question whether my appointments are going to get lost or if the system was running, I don't have these issue with Groom Pro. All of my information is safe with Groom Pro! Scheduling is fast and easy and I can access it anywhere in the system without leaving the page I am currently on. I really love the online appointment request feature because it allows me to get client leads 24/7 and schedule them when it best fits my calendar. The look and feel of the software is the best I've ever used. I also LOVE the dynamic and flexible pricing model they offer. You can literally price by anything AND it hold both my services and my items! It also tracks the inventory, so ordering low inventory items is a breeze. Another huge pro is the customer support. Not only are they fast to respond, but they are a huge help!! They will walk you through any issues without hesitation! And they listen to suggestions!! I will have a suggestion and then bam, I see my suggestion in the system! They make me feel like a valued client! My clients have even complimented the system. They love the receipts, the online appointment requests, and especially the SMS messages. They can contact me whenever they need! Everything in the system from adding a new client to checking out an appt is fast, which is a pro being on a mobile device! Literally everything is a breeze (even the inventory and employee schedule!). Cons: Absolutely nothing at all! Overall: I absolutely LOVE Groom Pro! The system is really fast and super easy to use. As a housecall pet groomer, time is money and Groom Pro helps me utilize my time and maximize by income. I can schedule new and returning clients quickly and with just a few clicks. The automated email and text message reminders help my clients remember their appointments, so I don't have any no-shows! Another huge plus is that I can use this software on my phone without it taking up a lot of data (which is a huge benefit being on the road all road). I can access this software from anywhere. I ran into a client at the store the other day and was able to schedule an appointment for them quickly, how awesome! The new update has only made this system even faster, easier to use, and better! Recommendations to other buyers: The best software in the market. If you are looking, start here and don't bother wasting your time with anything else because you will never want to leave this software, I promise you! I have wasted time with other software and I find either 1. they are basic and do not handle pet specific business or 2. they just don't offer everything that I need/they are a lot more pricey. My business has nearly doubled after switching to Groom Pro, so thank you Groom Pro for such an awesome system! This software has made running my NEW GROWING business SO MUCH EASIER!! LOVE IT!!! Pros: 1- LOVE the calendar feature and accessibility from ANY DEVICE. All employees can access at any time and everybody can be on the same page. Changes made can be seen by other staff members immediately. Where ever they are! 2-LOVE that they are adding new features, improving and updating as they assess the needs of their consumers (us groomers!) You feel like your voice is heard when you share your thoughts on what would make a great software even better for your business! I'm so glad I started using Pawfinity at the START of my business. I started with 50 clients and in less than a year it's grown to over 200... I know for a fact I couldn't have kept everything EASILY organized without this comprehensive software! It has just about every feature you need to run your business, from keeping track of inventory, clients, tips, wages, expenses, salary, POS AND SO MUCH MORE!!! I would highly recommend it! Never looking back! Paper and pencil?? Nope! Cons: The POS hardware suggested uses the card swipe as the ONLY option. It would have been better if you would add the ability to use a client facing screen such as what Square and Clover use. My reason: Extremely important to me for the client to SEE the option of adding a tip. We don't like ASKING for verbally suggesting one. Our tips increased drastically when I switched to a credit card system that has a client facing screen and suggests a tip BEFORE they sign and complete transaction. I currently use Clover strictly for that feature. 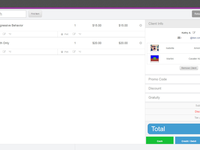 Everything else is already included in Pawfinity like receipts and inventory. Thank you for this wonderful review! I am happy to hear that Pawfinity has helped organize your business over the past year. We are excited to be a part of your journey as your business continues to grow! Keep up the great work! Pros: The software is very user friendly, they are always adding new features and every single time I get exited with the new updates. Everything that we suggest, they put it into consideration and the fact that they love to hear our suggestion makes us love it even more. I have spoke with the founder of Pawfinity on the phone once for help on the software and he answered every single question I had, plus he took the time to listen to all the things I would like to see added or modified to the software. I really recommend them to anyone that is looking for a Grooming Software. I'm a Pawfinity daily user and will be for a very long time as its really helping my business grow, My clients uses my online application to register, they also book online which is very nice. I have done lots of researches for a good software and Pawfinity is the best and safest one out there with very nice features and many more to come. Cons: They don't have any phone to get a hold of them but they have a support center in their software and reply very fast so I don't really think its an issue, plus if you really need a call, you just message them and they will schedule a call for you. Thank you for the kind words! We appreciate each and every one of our client's suggestions. It's those wonderful suggestions that has helped us create a software that is loved by so many pet pros worldwide! Pros: I liked how it was easy to use and customize for my liking. It was also very helpful when I was starting out my business- all the clients said i was so professional. Cons: It didn't help me very much as far as being mobile with any helpful mapping features for scheduling a route more economical. I also wished it had auto text reminders as many clients don't check email enough. I did find customer service to be helpful as well but it was called Groom Pro and then changed to Pawfinity so I don't know if any management changed as well? Thank you for the detailed review, however there are various points that are inaccurate, likely because your most recent account was active for only a month, over a year ago. SMS reminders have been available since 2016, and active mobile mapping was added with V3.6 (12/17). There was no change in management during the name change, which was a strategic re-branding to better reflect our quickly expanding product. We are currently developing some incredible innovations which will take both mobile and salon businesses to the next level. 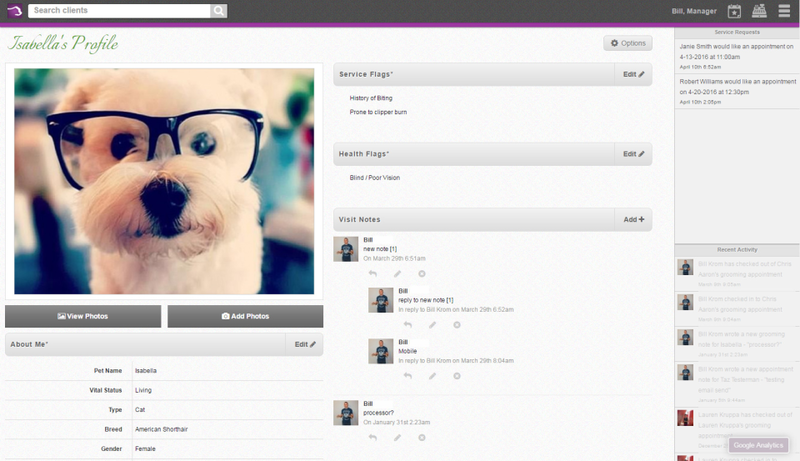 Pros: Ability to create detailed client profiles. Accounting and retail tracking is awesome. Recurring and reminders are important features. Online access is the best for never losing client data. Pawfinity is the best hands down. Cons: Needs easier access (one click) service details/history and pricing please. Pop up of last visit details would be great upon viewing profile. Pricing would be fair is these features was added. Thank you for the kind words Ashley! A few notes on your comments: The last visit / service details are available after locating your client in the header search area, which is available on every screen to allow for quick access. The balance between simplicity and data richness is something we keep a close eye on and are constantly perfecting. Keep in mind that as the level of detail in your data increases, your ability to reach such rich data in one-click decreases (our pet service businesses are quite complex!). Feel free to reach out through your support channel for tips on information access shortcuts! Pros: Nothing, as nothing really works as would be expected right now. There are many fantastic features that ALMOST work well, but they don't. Things that almost work: scheduling, pricing, CRM, SMS. Cons: Appointments are popping up on random groomers, appointments from the past are showing up in the future, the same appointments are showing up on multiple groomers. Price history didn't migrate in the update. There isn't a way to initiate SMS with a customer; you can only respond to messages sent by customers. It's almost impossible to figure out which groomers have appointments available, as the appointment book is seemingly displayed at random and in no particular order. Overall: Groom Pro used to be one of the best grooming software solutions. Then they updated it. Now the software is next to useless. The changes are actually why I ended up at this site, searching for better software. The updates made booking a nightmare, there are glitches everywhere, and our entire client pricing history was removed. We contacted the support, which is a joke, and were basically told that we needed to learn to use the new software. Most of the software functionality is currently unusable. Tasks which took one button click in the previous version of Groom Pro now take up to 4 clicks. For example, in order to add a tip to a groomer, which used to be simply filling it in at checkout, now requires clicking the tips button, then entering the tip amount, then selecting the groomer to tip. The update is full of nonsensical changes like this that increase the amount of time it takes to complete tasks and kills workflow. Recommendations to other buyers: I contacted Groom Pro "customer service" (if you can call it that) to try and address these issues and was treated condescendingly and told my constructive feedback was rude. Avoid this software at all costs until they work the bugs out of version 3.0 (which was already reverted once due to massive negative customer feedback)! Their customer service is horrible. This review is blatant slander and a simple attempt to devalue our review rank. Had Wesley expressed more professional composure and been less affected by change, he would have found the support he was looking for one well-mannered question away. Wesley unfortunately seemed more interested in abusing our support staff with cynical rhetoric and condescending rubbish than with handling himself professionally, digging in with the diligence of a business manager, and leading his staff toward success. The majority of his complaints were a result of his reluctance to utilize our detailed, step-by-step training videos along with the instruction of our renowned support to help resolve his confusion. If Wesley had trusted in our development team, he would have seen that one of his biggest gripes, and concordantly one of his few substantive complaints, would had been addressed in just weeks, as we have reintroduced the staff view on the calendar (and more) at the request of our loyal clients. Pros: The customer service, information tracked, speed, reliability, portability, ease of use...honestly, the list goes on and on. Cons: Nothing that would prevent me from looking forward to logging in every morning. Overall: We did the trial run and talked directly with FIVE different software programs before choosing who to go with. Pawfinity definitely blew the rest out of the water. We can quickly get information, reports, tracking, snapshots, and many of the tools we use to maintain and build our business. 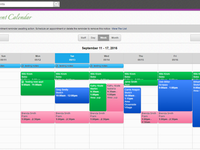 Scheduling is a breeze and its easy to learn the basics to get going. 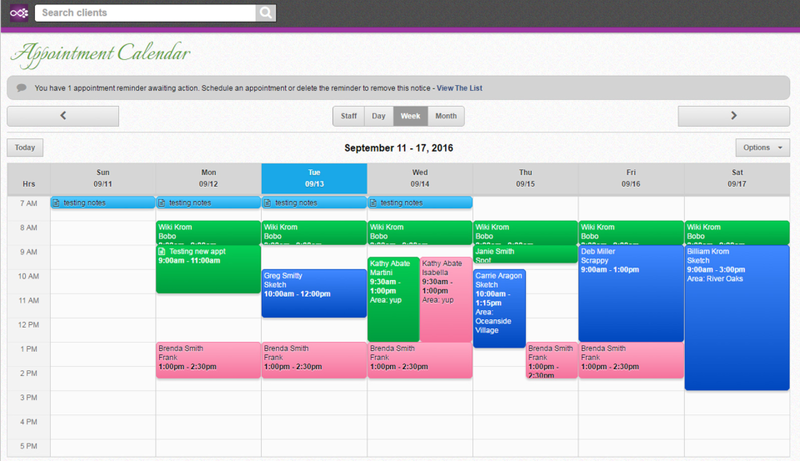 We've had multiple positive comments from my clients who are loving the online scheduler. The entire program is not only a great time saver for us, but it's a great tool for entering pet trim and behavior notes for the groomers. We are now getting into selling products in-store and the inventory tracker is super. The customer service is top notch, as well. EVERY question we've ever had is answered promptly and even the suggestions we've offered are listened to and taken into consideration. We are only kicking ourselves for not having this program when we opened. The time it would have saved! We could have been focused on BUILDING our client base instead of wasting hours each week just keeping track of it. Pawfinity is absolutely a TOP NOTCH program. We would recommend no other. Recommendations to other buyers: Only a few little tweaks. Cons: Terrible performance. When updating pets to customers it would take an eternity to input data on an iPad Pro. Our customer and pet database could not be exported (specially together) ...to migrate to a different vendor, when I reached out to customer service for help they told me that was not an offered option, to which I complained, and their CS representative challenged me to find in their service agreement where it said that our business customers and pets database was to be made available (basically to make it imposible go to a different vendor). Wait of our time and money. While we appreciate the time spent to leave us this praise, the information contained within seems to have been altered slightly. I have looked into your claim Francisco and found some discrepancies in your report. We do not have any communications between yourself and our support staff. We currently have only one support conversation which was between Kilyn Horton and our team. None of the content contained within could be considered "bullying", as the replies simply the explain where to download a client list. The second reply reiterated how to download your client list, as well as how to cancel your account, ending with a question on why Kylin was so quick to threaten our company with such little content in communication. In reference to your performance claim, in an real-world test, the Add Pet process completes in 128 milliseconds (about 1/10 sec) and the form itself takes 30 seconds to fill out. Pros: Customer service and thoroughness of the program to cover everything from the Financials to the clients and their pets. Easy to use as well. Cons: Since they are constantly adding additional features and improvements I have no complaints. 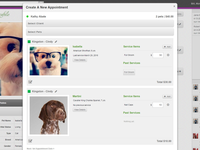 Overall: All of the features I need to run my house call pet grooming business is in this one CRM. No need to have separate applications for customer files, calendar, and payments. They have thought of everything...but by far my favorite feature is the top notch customer support. I'm impressed that the system is run by groomers, for groomers and anytime someone asks me for a recommendation I tell them Pawfinity is the best. I had tried several CRMs before finding this one, and I am completely satisfied with my choice. Truly the best in my opinion! I am extremely happy with Pawfinity. Pros: That customers can follow a link to book their own appointments online or fill out their own customer profile. Its a real time saver. Cons: That they do not yet offer complete day mapping. I would like to be able to see all my appointments for the day on a map that way i can arrange them in order or routing and what makes the most sense to be fuel efficient. I do like that you are able to see each appointment on a map and navigate to each appointment from google maps but I wish I was able to see all the days appointment on one map at one time. I also wish it would help me fill spots during slow times by pulling a list of people within the area i will be in that day that are due for a grooming soon. 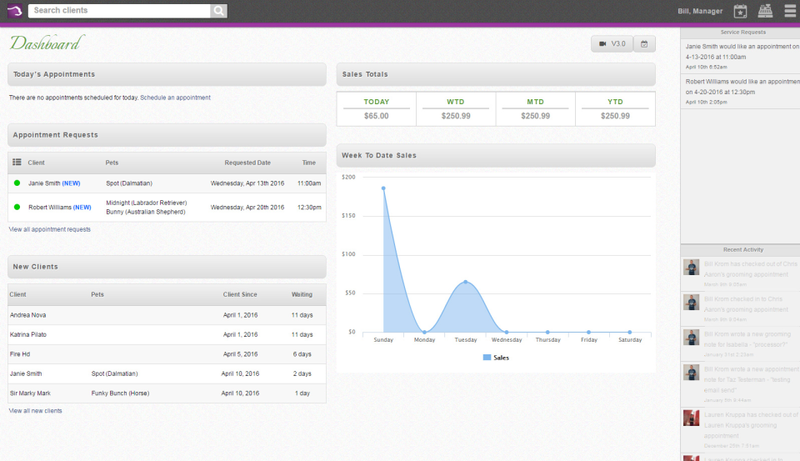 Overall: Ability to manage appointments online myself or have customer manage their own appointments. My company also benefits from the navigation and calling/texting features associated with the program. The POS and reports help me compare my financials with quickbooks and square. Hi Rachel, thank you for the kind words! It's great to hear that Pawfinity has saved you much time! Pros: the integrated text reminders, the recurring series option. the client profiles. the link for clients to visit page and create profiles and request appts. Thank you for your great review Rita! I just wanted to let you know that we do offer appointment confirmations via text! Also, we have optimized the mobile use of the software, making it very easy to use on mobile devices. Feel free to reach out through the support channel for any questions! Pros: I like that they listen to their customers and give us what we want and need all the while keeping up with the latest technology and security. I really have no complaints. It is fast, reliable and easy to use. Thank you for the kind words! We are happy to have provided a fast and reliable software for your mobile grooming business these past 2 years! Pros: There are so many things I love about Pawfinity. From the ease of use to the awesome customer service to the great features, Pawfinity is perfect for boarding facilities of all sizes. I run a large facilittle with two locations and I am able to easily manage both locations with Pawfinity. Since it''s web based I can keep track of everything that is happening at each location without even being there. Honestly the best part about pawfinity is the customer service. Anytime you have a question or need help their team will answer your questions thourghly the first time through. Cons: We love everything about pawfinity. My only con is that I wasted my time using other software options before them! Cons: Charges a fee for every text message sent so it get a little pricey for my small salon. Customer service is lightening fast but the only contact I've been able to find with them is email, sometimes I would like a phone number to be able to talk to someone. Overall: I love the text reminders , that saves me so much time. I also love the colander and it's ease of use. Thank you for the great review Jennifer! I am happy to hear that Pawfinity has become an important part of your business! While there are charges for SMS usage, please remember that email notifications are always free! We offer support through the support center, however, if you ever needed a phone call we'd always be happy to schedule one with you! I use Pawfinity for my mobile grooming business. Pros: I love that each employee and event can have their own calendar. I also love that clients fill out their own profile. Cons: Because we are mobile and use the program mostly on IPads/phones during the day, I wish it was more user friendly with the way the screens overlap. Thank you for the great review Debbie! We have greatly optimized our mobile usage! Feel free to reach out through the support channel for any tips or questions! Scheduling is important and is great that it has a cellphone format! Comments: Vaccinations should be able to be completed in full on the first screen. Printing receipts from computer to the printer should be able to be done without the POS printer offered. Should be able to change payment date so that in some cases the payment can match the date services were completed. Should be able to schedule new client appointment without all the required pet info and saving them in the system when they haven't actually come in for services yet. There are a few other things but I have lost my list. Hi Michelle, thank you for the review. I would like to leave a few points of clarification for anyone browsing this review, followed by a new support ticket in your dashboard to clarify everything in detail. You are able to print client receipts and invoices from any standard inkjet or laserjet printer. Our calendar notes make for a wonderful place to store temporary notes on clients when you don't have the time to create profiles. Keep in mind that once stored, client information is available in a matter of seconds from any page in the entire system. I will provide details and training resources to help with this and many other features in my upcoming support ticket. Pros: Ease of use and quick set up. Customer service quickly responds. The new version has all the tools to run our boarding kennel. Thank you for the great review Heather! I am glad to hear that Pawfinity has everything needed to run your boarding facility! Overall: This software is very easy to use. The fact that I can make appointments on any of my web-ready devices is a huge plus since I have people that contact me outside of business hours on a regular basis. The customer service department gets back to me very quickly if I have any issues. Comments: I like the overall product. Getting the clients to input their own information is very handy when I am out and about doing mobile appointments. The only thing that I would change is that the customer is automatically sent a email after they sign up- and along with that is a price (and it does not account for what may have been discussed). It has caused some confusion with new clients. Overall my experience has been wonderful. I tested out two other sites before going with Groom-Pro. Hi Crystal! Thank you for the positive review! Two quick points to clarify is that the "welcome" email sent to clients is part of the email opt-in / verification process to prevent unsolicited email (spam) to clients. if a client clicks the link in the email, they are confirming that they do exist and want to receive notification email from the pet groomer. 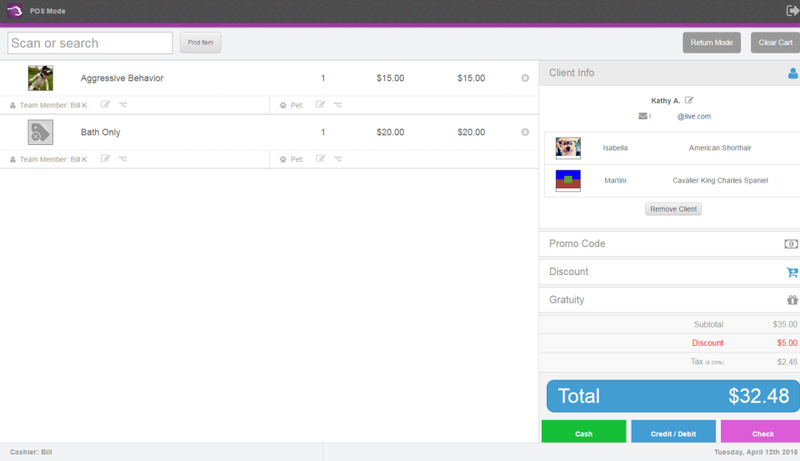 Also, groom pricing is never sent to a client and is not visible from the client dashboard. Thanks again for the positive review! Small boutique with 4 groomers. Comments: We have been using Groom Pro since December of 2014. 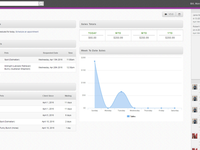 The 60 day free trial makes it easy to check out the software and use it in a "live"situation. We had approximately 600 plus customers with all of their information on cards. Now we don't have a problem with a misfiled card or cant read the information on the card. With access to each client by using their name, their dogs name, phone number or email address we can pull them up instantly. We have only had a few questions because of this "user friendly" program and these questions were answered very promptly via email by their Customer Support Department. Our groomers were very skeptical of this software at first but after using it a few times they all fell in love with it. We placed Chromebooks in each grooming room and because it is web based they can see important information on their cell phones too. I would suggest that any one looking into a grooming program check out Groom Pro, you will be glad you did. Comments: I run a mobile grooming business all by my lonesome and Groom Pro us the ONLY reason I am able to stay affloat. All my customers love it and tell me how professional my business is, it's nice to know they notice. The customer support is amazing. Usually same day responses, and super friendly, patient and heloful - I've asked a lot of questions. I don't know many Cons, but there is a few things I'd like to tweak for it to suit my style and preferences better but they take suggestions, so it's nice. I know they can't implement everything I ask buthe it's nice knowing they appreciate my suggestion. Pro, so easy to use. I use on my smart phone one handed sometimes. It's very quick and really saves me a lot of time when I am on the go. I've looked into EVERY grooming appointment software and appointment booking software, groom pro really is great for what you pay. Not good with computers, but the pawfinity is easy to use. Easy to navigate and use . Pros: I like the picture of the pet feature. It's easy to use for a tech dumby like me. It is nice that it keeps track of vaccines and other info and is saving trees. Love the paperless idea. You don't have to have file cabinets cluttering up the office area. There isn't anything that I don't like about the program. It could be a little easier to download the pet photos. Thank you for the kind words Martha! I am glad to hear that you are finding Pawfinity easy to use! Love Love Love this program!!! Pros: Text appointment reminders and text when ready! My clients love it! POS is easy to use. Simple to move appointments. Cons: Need to be able to modify the texts that are sent out. Drag and drop appointment movement. Automatically check out as the person the dog is booked under. Hi Susan, thank you for the great review! I am glad to hear that your clients are loving the SMS features. We have made moving appointments very quick and easy, so if you have any questions feel free to reach out through the support center! Comments: We are mobile groomers and really have little to no office time so having this online schedule is a lifesaver. We have 200 clients with appointments scheduled through 2015 and 50 on our waitlist. Before we had this managing that waitlist was a nightmare. Figuring out who had been on the list longer and if they were close to where we would be at that time was impossible to do on the go. Now all of this is a click away on the tablet. There are sometimes hiccups or things I wish would work a certain way but all I have to do is submit a support request or suggestion and I get an answer in no time flat! And some of the suggestions I've been told will be included in coming versions. I tried many other online calendars and schedulers and this is the best for us as Mobile groomers and I hope will continue to be great as we expand to include a Salon as well. Pros: It's ease of use and its completeness. It encompasses everything you could possibly need. Overall: When starting our own mobile dog grooming business we knew we needed a piece of software that would keep track of our client base, their dogs, and our scheduling, and Pawfinity sure meets that need! They have the BEST customer support when it comes to questions about how their software works and it's ease of use is phenomenal. It works great on mobile devices of all kinds as well, which is crucial for a mobile business. A+ Pawfinity! Cons: Right now I can't say I have a con bc they really try to make the impossible happen and when they can't, they say so! Overall: What I love most is that I can give a suggestion for a new feature that helps me in my day and they seriously consider it and I've even had a feature implemented! The point is, THEY LISTEN!!! Recommendations to other buyers: I've used other programs that were complicated and not technologically up to date. I see myself being a customer for life! Comments: I'm new to grooming software but this appealed to me because it's web-based and has a lot of features. And at such an affordable price! The clincher was the long trial period. I figured it would give me time to really use it and decide if it was right for me. I was concerned that it was designed to be used for more than what I needed and that it would likely be unnecessarily complicated for my purposes. So not true! It's super easy and convenient to access even on my smart phone. When I needed more in depth understanding in the beginning I found online tech support was right there, swift with responses and both willing and capable of handling my silly questions...long past business hours. What else can I say? I'm a fan and a happy user for years to come I'm sure. Much better than software you install on a computer! Comments: I bought a shop that was using Kennel Connections, which is a software for grooming shops and kennels that you have to install on your computer. The problem with that is, if your computer dies, how can you get to your valuable customer information? This solves that issue. Even if my internet goes out, I can pull it up on my phone and it's just as easy to use. The customer service is really great, so far. The pros outweigh the cons, of which there are few: cons would include: it's a little lengthy to switch a dog to a different groomer's schedule, the phone number fields are not customizable, and there is no space yet for inventory. But I believe this service will grow, and I don't know what I would do without it! Comments: Love this program. Makes my life so much easier, with booking available on any online device - I and my staff can book appointments and check our schedules on a cell phone or on the computer or whatever. The new version is great. There is still some room for improvement (as with anything new), but I am happy to see new updates/features added regularly and quick replies to any questions or concerns I have had. I love that we can book appointments, keep track of clients, have a POS system (cash register) with an inventory, and keep track of accounting and sales - all with one program. It is online which means it can be accessed from anywhere and doesn't need to be downloaded at all. Veteran groomer, starting mobile for the first time. This helped me stay organize. Comments: I really like the ease of use of this software. I was so used to one program for 10 years, and I am not very computer literate. This was a lot of help for me. I was able to figure things out very quickly. I like the map and how it connects with my google maps app. I would like to see a customizable breed list where I can type in my own breeds. I would also like to see and be able to manage a vet database. It would be cool to see the map be able to route the day's appointments. Comments: We are a small grooming salon in Cleveland, OH and have been using Pawfinity (aka Groom Pro) for several years. It has provided us with an economical and efficient way to keep track of all our clients. Even with 6 groomers it is very easy for us to schedule and track each dog. With this program being "web based" and with new features like SMS texting for reminders our job is just getting easier. Another thing that seperates this program from others is the great customer service. Recently I had a problem on a Sunday and their staff worked dilligently all day until it was fixed. Comments: Groom Pro has been a life-saver! I hired an employee last year and trying to do everything on paper was becoming time-consuming and counter productive. I have saved countless hours in the office thanks to this program. Groom Pro is so easy to use and can be accessed by multiple employee's making communication between staff and clients much clearer and easier. I have used other programs in the past and they were not nearly as useful as this one! Plus you can't beat the price or the customer service! The Groom Pro team has figured out how to provide the best in service and the product they offer. Thanks to them my life is so much easier! Comments: I love GroomPro. It saves me so much time because it sends out the email reminders automatically and I can add notes on the grooms as I am doing them. 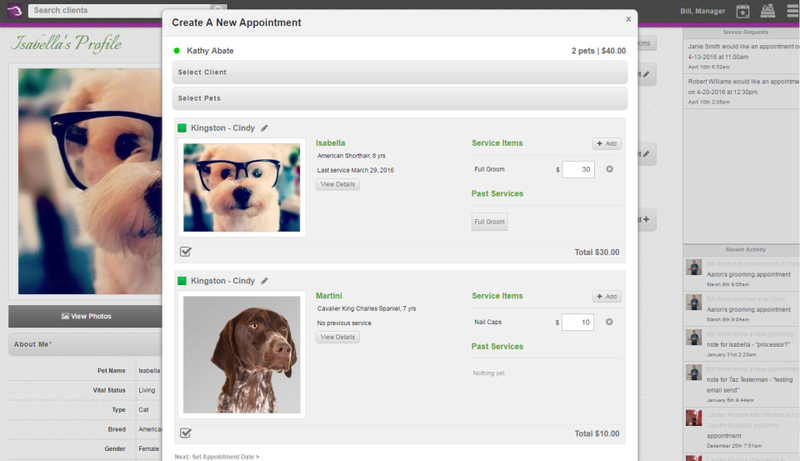 Also - customers like the login page and that they can upload pictures of their pets. Comments: Pawfinity has not only reduced paperwork for clients info but has also made accounts easier to read profits weekly, monthly and annually and to record sales, it easy to book appointments in or out of the office. Another way for clients to request bookings. Easy to program your clients details on line, giving me more time getting to know the new clients on their arrival. Easy to input products and services. I have only used customer services once and they helped straight away. Value for money as reduces office and paperwork hours. Comments: I love the ease of booking clients for their appointments and the reminders and confirmations emails that automatically go out are great! The only con I have is that my current clients seem to miss the Welcome email where they need to verify that they are my client in order to receive the confirmation and reminder emails. It is a bit of a barrier to ask them to create a user name and password in the system since they are so used to me handling everything for them for the scheduling. Otherwise, the product does what it is supposed to and is great! Great and easy software t work . Comments: We signed for this program almost 4 months ago but we start working with this software since beginning of December. I think it would be a very good help if we can have the option of printing clientele addresses on labels. Hi Mandana! Thank you for the positive feedback. You're in luck! You can export your client list from the main client page and open the file with a label creator like those available from Avery. Once the client info is in the program, simply add the special paper to your printer and voila! Thanks again! Comments: I'm not very good with computers, and put off getting the software for a year and used the old fashioned appointment diary and care cards, I have only been using pro for a few weeks but already finding it so easy, no more routing through hundreds of care cards looking for a name, now hi just start typing either the dog or clients name and it pops up. I can't recommend the software enough, wish I had used it from the beginning . Comments: I have a mobile grooming salon. I switched over to GroomPro from 123 Pet Software, and I've never been happier. It was so easy to convert the software, they imported all of my client and pet information. They were so patient with my questions during my learning curve. My clients love everything being online, and for those that don't have computers I still have the option to print paper invoices. The expense tracking and reporting options are amazing. A happy customer here! Love to stay coneceted all the time with accurate information about my business. Comments: Love Groom Pro. I love the fact that at any time I can set up an appointment from my phone, iPad or computer. Many of our customers request appointments to us via Facebook at off schedule hours and I can set it up immediately from my phone no matter my location. Also love the way I can monitor the finance of my shop and how easy it is to create a CSV list for email campaigns. The only con is that I can't customize the automated emails it sends to my customers! Comments: Overall the program is awesome! Only complaint is that they don't have all the designer breeds in the computer system. Would also be nice if there was a call line for customer service. I will say that they do make a great effort to reply very quickly and will to help with all they can. The other thing i would make available is that customers could contact me over messages to make appointments other then when they first make a profile. Overall great program. Made the switch from 123PetSoftware...so glad I did! Comments: It feels as though this software was made by someone who picked our brain to incorporate only the necessary information that we would need to smoothly operate our business. Thanks for making a straight forward and easy program to use. Customer service is amazing! They answer questions right away. I love having access to the software from anywhere without having to pay extra. 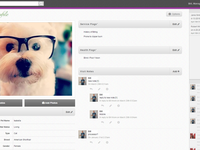 Customers really like having their own access to their pets profiles to load pictures. Comments: I love Groom-Pro. It makes scheduling so easy. I like the ease of client record keeping with this program. Love that it works across all my devices, so if I have an issue with one, I can use it on another. My only wish is mapping for scheduling routes and appointments based on my route, since I'm mobile. Overall is a good program. Comments: I used Kennel link in the past and i liked it....i love tht groom pro has the client application link it saves so much time....i do not like tht you can not edit the date of check out if u forget to check a dog and i dont like the reminder list feature or the waybthe reports are ran....or the calenders. Lol i dont like a lot of stuff but The client application is what has made me stay with this company. Genius saves so much time!!! Love it. Comments: I have been using Pawfinity now for the last 6 months. Customer support is fast and always helpful. It's very easy to learn and what I love best is that my clients can request a booking online through our website. I also like products that keep evolving, and that is exactly what Pawfinity does. It keeps upgrading and adding new features! It is a great product to use as you grow your business! Easy for groomers and reception to use! Comments: This web based software allows multiple users to be logged in so you the groomer and any admin staff know what is going on all the time. Very easy to use. Their customers support is stellar, typically I have an answer to any questions right away. The developer is constantly updating with new features. I tried 5 or 6 demo versions of software, spent dozens of hours testing them in our shop and this one was the one I chose. Effective And Efficient.. Wish I had found it years ago! Comments: Great software, fantastic database of clients and pets including photos, very easy to use and fantastic customer support. The only reason that I have not given the extra star is that my previous appointment software issued sms reminders to customers, this greatly reduced no-shows. Hopefully this will come soon as that will be the icing on the top of what is already a very nice cake!! Comments: When I started at the salon I am at, they kept client files on index cards and wrote appointments on a desk calendar. After many mistakes and lost cards I purchased groom pro. I love having everything in one place. The system is nicely organized. I love that I can check the schedule from anywhere on any internet enabled device with my login. It gave me the professional touch my salon needed! Comments: I just started recently to schedule appointments for a grooming service. I found most of the program to be very self explanatory with any computer experience. When I did need to look something up, there are lots of videos available to show me what to do. If I can't find it quick enough there, then I have found the customer service response to be excellent! Very user friendly program! Comments: Switching to Groom Pro from paper files takes some getting used to. I did have to invest in a desktop vs. an ipad. Running the program on the ipad was not functional for our salon. I do hope that at some point they add online scheduling for our customers. Otherwise the interface is great and I much prefer it over the other trials I looked into.